Raman, Low-temperature Cell, Cryocell, Transfer gas. A novel transfer-gas low temperature cell especially designed for use in Raman spectrometers is described. The cell is very low in height yet has excellent thermal performance. Spectra of solids and several liquids cooled below their melting point are provided. The alternative is the “transfer gas” system. In the latter [Figure 1b], the refrigerant cools the inside wall of a vertical tube and induces convection down the wall and up the centre of the central tube. The sample is hung in the central tube, which is NOT evacuated. Both cells can be devised to incorporate a variety of windows, but each has advantages over the other – see Table 1. Very easy to use a wide range of windows Not easy to devise cells with windows other than glass or quartz.If other materials are used the evacuated space must be continuously pumped. 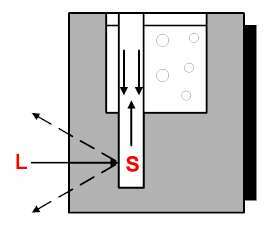 Although they function adequately, the gas convection path in the simple cell (drawn in Figure 1a above) is ill defined and hence the heat transfer from the sample to the refrigerant can be poor. This particularly applies if the cell is relatively squat. Tall cells can often be accommodated in spectrometers, but are problematic in almost all of the contemporary commercial Raman spectrometer sample areas e.g., the Perkin Elmer, BioRad or Nicolet F-T Raman spectrometers, where the sample chamber lids permit of only short cells, yet the lid must be closed because it is interlocked with the potential hazardous class 4b lasers used in these instruments. In this paper, we describe a novel cell of very low stature but of outstanding heat transfer characteristics. The new cell is constructed entirely from borosilicate glass and consists of a low aspect cylindrical Dewer vessel interrupted by two vertical tubes and interconnecting passages. The form of the cell is shown in Figure 2a. The cell once constructed is evacuated. The evacuated volume is shown as a shaded area in Figure 2a. The sample tube S, the shaft in the centre of the device and the two horizontal interconnecting passages are open to the atmosphere. Liquid refrigerant poured into the Dewer vessel will cool shaft C inducing vigorous convection of the air inside it – see arrows in Figure 2a. It is worth remembering that cooling to liquid nitrogen temperatures, triples the density of the gas above its room temperature value, so rapid flow is inevitable. Samples held in NMR tubes were suspended vertically in tube S and examined by illumination with a laser along vector L, the scattered light passing through the glass walls to be collected and analysed by the spectrometer. 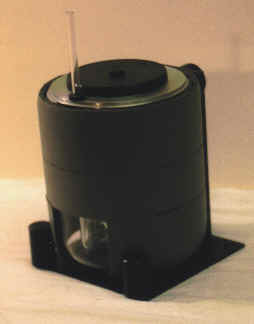 As a comparison, a commercial Ventacon Model C-1 cell was used [see Figure 2b]. The height and diameter of both devices is similar. Again we illustrate the method of illumination and view and indicate the gas convection. All spectra were recorded on a Perkin Elmer 2000R spectrometer at 1cm-1 resolution. Twenty co-added spectra were accumulated in each case. The cell shown in Figure 2a was fabricated from medium wall Pyrex borosilicate tubing. Initially the inner and sample chambers were prepared; the latter having a small removeable plug of graphite tape inserted into the open top approximately 10mm below the surface to facilitate blowing. The centre chamber was supported and sealed into a length of 75mm O.D. tubing which had been previously prepared by flaring at the top to 120mm O.D. and rounded at the bottom. The sample chamber was added making sure its open end with temporary plug was extremely close but not touching the flare, this was then annealed. The unit was supported inside a length of 120mm O.D. tubing, the dewar seal and the seal to the sample chamber being constructed simultaneously, the sample chamber seal was opened up to form a hole. A side arm was added for evacuation and the assembly annealed after which the temporary plug was extracted. A thick concave bottom was constructed as its base in order to increase its mechanical strength before its final annealing and evacuation. To gauge the comparative performance of the two cells, temperature readings were made using several refrigerants in each cell. It is quite obvious from the readings presented in Table 2 that the new cell out-performs the conventional one. What is not apparent is the rate at which a sample introduced into the cell cools – this is markedly faster in the new cell. Table 2. Temperatures achieved using the novel transfer gas cell and a comparable commercial cell. If a transfer gas cell is open to the atmosphere and it works really well [e.g. the Ventacon Cryocells produced some years ago for conventional Raman spectroscopy, were tall enough to induce excellent heat transfer], oxygen would condense at the bottom of the central shaft posing a potential hazard to users. This happens in the new cell if it is operated without its lid. The lid does not seal the cell but closes the device well enough to induce a flow of dry nitrogen down the central shaft C through the interconnecting tubes and out at the top of tube S. Fitting the lid improves the cooling slightly – see Table 2. It will be noticed that the temperature readings achieved in both cells exceed that of boiling liquid nitrogen (-196ºC). The reason is of course heat transfer through the walls of the Dewer vessel. The commercial cell is partially † silvered to reduce this problem. The new cell was NOT silvered although there is no reason why this is so. The lack of silvering did result in condensation on the outer glass surfaces, a problem not shared with the Ventacon cell. † Partial because the front of the cell must be transparent. Clearly it is of only academic interest to show that the cell develops low temperatures, its efficiency is crucial. To test this we recorded several low temperature spectra and compared them with those recorded at room temperature or above. Figures 3-8 show the spectra obtained from polytetrafluorocthylene – PTFE, chloroform and thionyl chloride. PTFE is, of course, solid both at room and cryogenic temperature. However, it undergoes a solid state transition around 19ºC from a 13/6 to a 15/7helical molecular structure. The process is well known and induces the change in the spectrum discussed as long ago as 1969! We show spectra recorded with sample temperatures near 35ºC and -5ºC in Figure 3 a and b. Several of the bands shift slightly e.g the bands near 1305 and 1380cm-1 and that around 295cm-1. The multiplet around 375-370cm-1shows changes in intensity but the main changes induced by the alteration of the helix angle lie around 600cm-1. Details of some of the several changes are emphasised in Figure 4. Figures 5 and 6 show the spectra of chloroform at room temperature (a), near -60ºC (b) and at a temperature around -155ºC. The freezing point of chloroform is -63.5ºC .The origin of all the bands is well understood and has been described in a recent article . Recorded at 1 cm-1 resolution, one Raman band, that near 370 cm-1 appears as a quadruplet due, it is confidently thought, to the isotopic distribution of 35Cl:37Cl around 3:1 on the ‘umbrella’ A class, fully symmetric deformation. Cooling to liquid nitrogen temperatures enhances the apparent resolution. Similarly, the C-H stretching mode near 300cm-1sharpens as the material solidifies. On the other hand, the remaining bands in the liquid change from singlet in the liquid to a variety of multiplets in the solid phase. See Figure 6. Figure 5. Raman spectra of chloroform recorded at room temperature (a) and when using solid CO2 (b) and liquid nitrogen (c) refrigerants. Thionyl chloride SOCl2 is a relatively hostile liquid, which freezes at -99.5ºC. It fumes in air hydrolising rapidly to SO2 and HCl. To study this material (or come to that chloroform) as a solid, it is far easier to record the low temperature spectra using a transfer-gas cell then it is to use a cold finger cell. In these, the vapour of the analyte is usually frozen onto the cold finger and the layer gradually built up in thickness. Once completed, the noxious nature of thionyl chloride makes ‘cleaning up’ most unpleasant. Transfer gas cells examine samples in glass tubes, which can indeed be sealed if required. The vibrational spectrum of thionyl chloride is well understood and is easily available . Cooling to the solid causes considerable line narrowing and division into multiplets due to crystal effects. Figure 7. Raman spectra of thionyl chloride recorded (a) at room temperature (b) and using solid CO2as refrigerant and in (c) using liquid nitrogen. Transfer gas cells are particularly attractive in Raman spectroscopy and the reasons for their use are discussed vis. they require no supporting vacuum pump, they can be made in a very compact form and samples can be changed rapidly. Further, the sample is not itself evacuated and this can be invaluable. 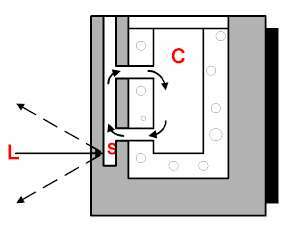 In commercial Raman instruments, the height between the sample cell mount and the closed lid of the sample chamber is restricted (typically only 200 mm or even less) and this restricts, in turn, the height of the cryocell. Squat transfer cells suffer from two problems – the transfer of thermal energy is inefficient and their capacity for liquid refrigerant is small, so that they need frequent re-filling. The novel cryocell described in this paper solves both problems. C.W. Bunn and H. Edwards, Nature, 174, 549 (1969). 1b. M.J. Hannon, F.J. Boerio and J.L. Koenig, J.Chem.Phys., 50, 2829 (1969). K. Nakamoto, Infrared & Raman Spectra of Inorganic & Co­ordination Compounds, 5th ed. (two vol.set) J. Wiley & Sons, New York, 1997. S. Krimm, Fortschr Hockpolym-Forsch, 2, 115 (1969).